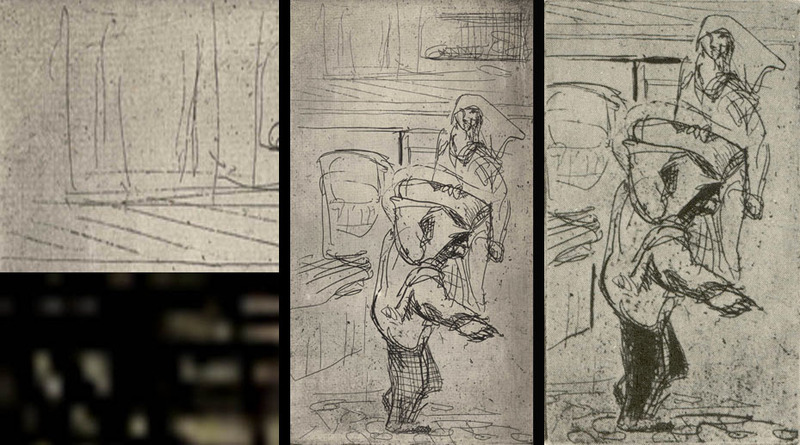 What are some of the principles guiding an artist’s hand when changing the shape of an image? cropping an image to achieve an aesthetic balance (based on the Golden Section proportions) between areas of drawing and areas left blank. To explain the use of these three principles, I will explore the cropping of Fred Williams’ etching, Coal Delivery, and Sir Francis Seymour Haden’s division of his original single printing plate image into the two print fragments: The Two Asses and Dundrum River. 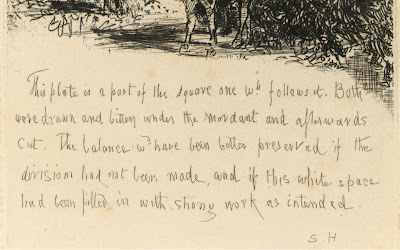 Clearly the following thoughts are my own and they are not those of the artists, but the driving issue is not really about these prints and the artists’ motivations but rather how the three principles can play a role in the decisive act of reshaping images. 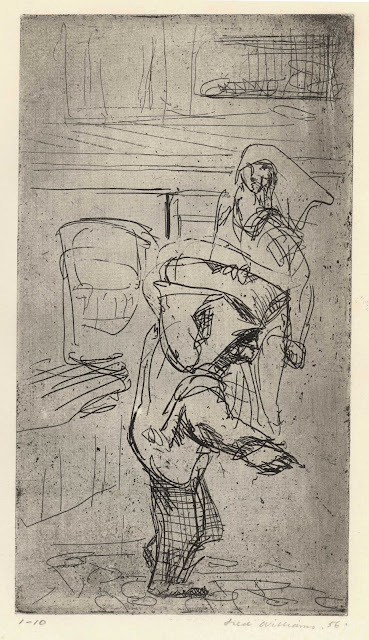 Regarding the first principle—cropping an image so that its shape is appropriate for the projected meaning—Williams’ first state of the etching, Coal Delivery (shown below) reveals the original composition that prompted Williams’ decision to cut the plate. 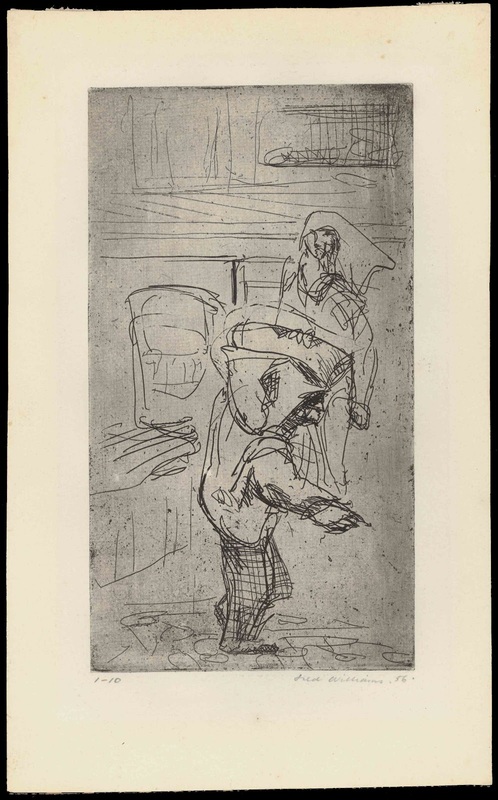 In this first state, the artist’s high viewpoint on two delivery workers captures the spirit of their everyday task. The elevated view with its resultant spatial foreshortening on the figures (see diagram below) draws attention to the sack carried on the shoulder of the foreground figure while the weight of this sack is suggested by the balance of the figure’s forward lean and outstretched arm. All this pictorial information expressing a fleeting moment is captured by Williams’ freely laid notational strokes, but I can see why Williams chose to reshape the composition even though it has all the essential components of the image in its final state: the background, as a broad field of virtually two-dimensional space, is distracting to the foreshortened viewpoint and the balanced movement of the foreground figure. In the final state of this print’s evolution, the top of the print is lowered and the left side is reduced (see diagram further below) to remove the distracting details and to focus attention on the figures. 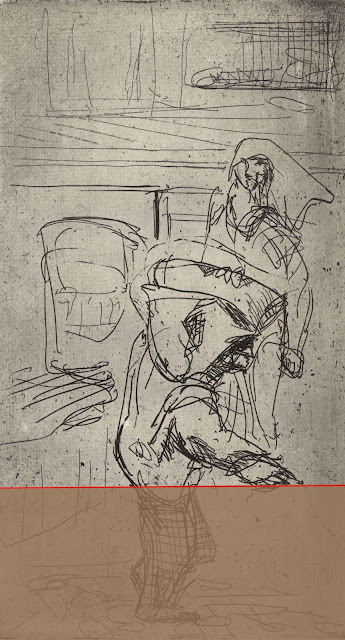 In short, William’s reduction in the image in the last state makes the point of the print much clearer—a brief moment of observed everyday reality in 1950’s London. Condition: This is a very rare impression (1/10) with minimal age toning otherwise pristine condition. 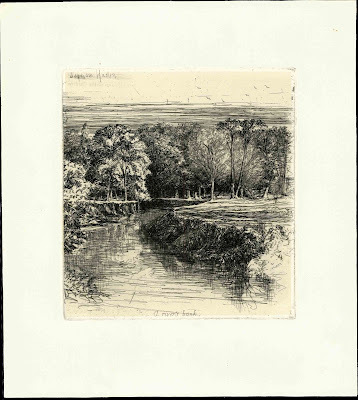 I am selling this print for $4380 AUD including postage and handling to anywhere in the world. Please contact me using the email link at the top of the page if you are interested or click the “Buy Now” button below. Regarding the second principle—cropping the featured subjects on a Golden Section —this principle is all about finding the aesthetic point (i.e. the “sweet” spot) along the length of a subject, or even a single line, where the artist’s intuition “knows” is the ideal point for cutting a subject. 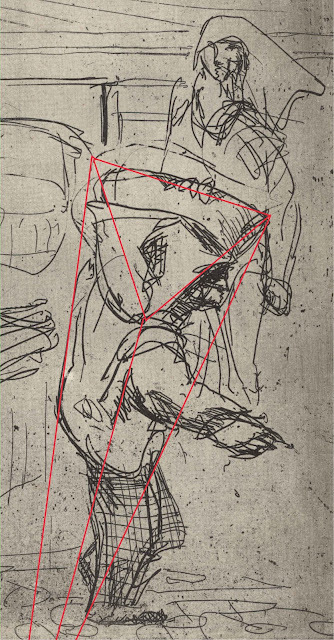 In the earlier post “Jacque & Legros: Human Scale” this aesthetic point in a line is shown as the Golden Section point. Rather than dwell further on the significance of this proportional division in a line (remembering that there are two of these points in any line) I will move the discussion to two places in a subject where cropping should be avoided—or carefully considered. 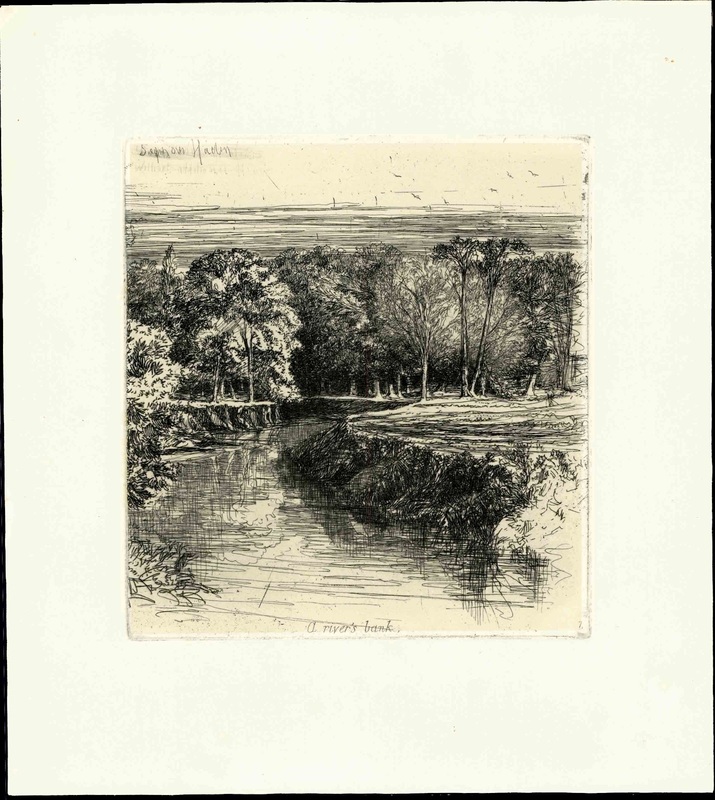 The second of these places to avoid featuring on a cropped edge is the centre of a portrayed subject. 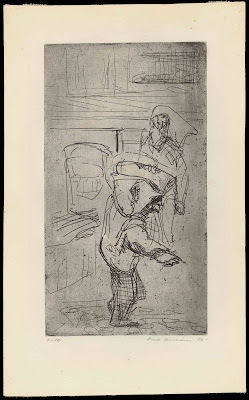 For instance, if Williams’ print were to be cropped along the figure’s groin (see below). 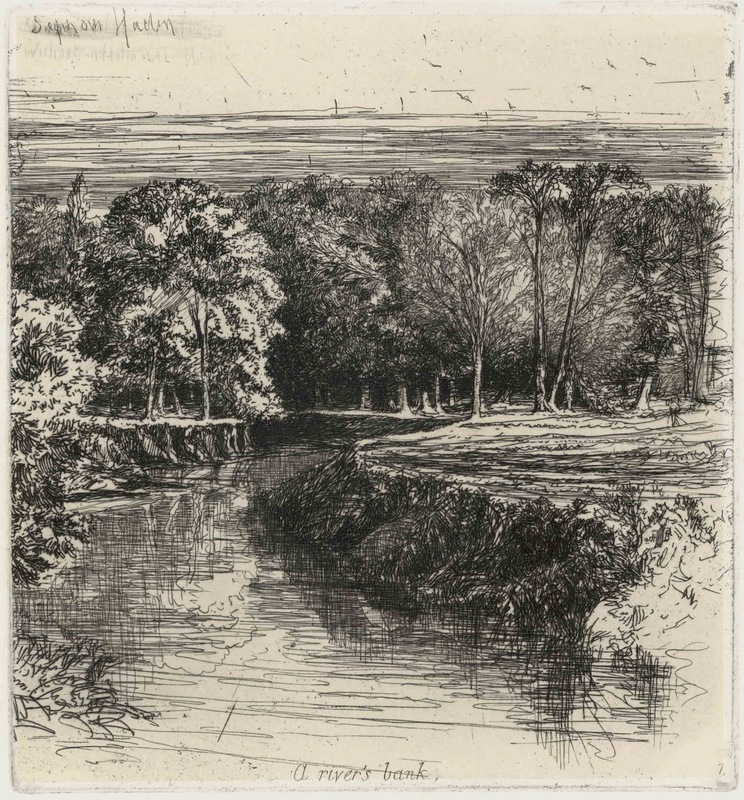 Once again, the centre of a subject is fascinating to the eye and thus may divert a viewer’s attention away from the projected meaning of the image. Regarding the third principle—cropping an image to achieve an aesthetic balance (based on the Golden Section proportions) between areas of drawing and areas left blank—this principle is all about artists employing their intuitive sense of what looks balanced. Like a traditional Japanese sand garden, where a harmonious balance is achieved by broad areas of raked sand and the psychological weight of a craggy rock, a similar balance is sought between the psychologically arresting strength of certain clusters of line and those areas (often blank) where visual demands are not placed on the eye. Achieving this balance can be rationalised by imagining that the balance would be perfect if all the black lines were dragged together (as if by some form of magnetism) and the amount of black in the image, in proportion to the amount of white paper, approximated the Golden ratio (see diagram below). Williams’ reshaping of this etching and the changes he then made to its composition, such as the added tone to the foreground figure’s trousers and strengthening of vertical and horizontal lines framing this figure, is fully understandable in terms of refining the focus of the image. Not all decisions however, are so clear and straight forward. 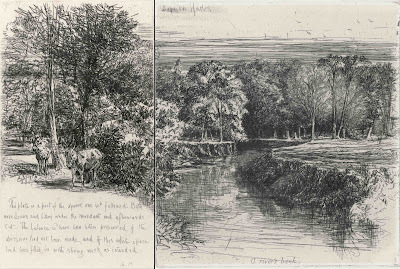 Sir Seymour Haden’s prints, The Two Asses and Dundrum River (shown below), are good examples of when the process of cropping an image has a disappointing outcome. Condition: strong impression with faint foxing mainly outside the plate area otherwise in good condition. Perhaps even more revealing about Haden’s view of The Two Asses is an insight by the printer of this etching, Frederick Goulding: “Mr. 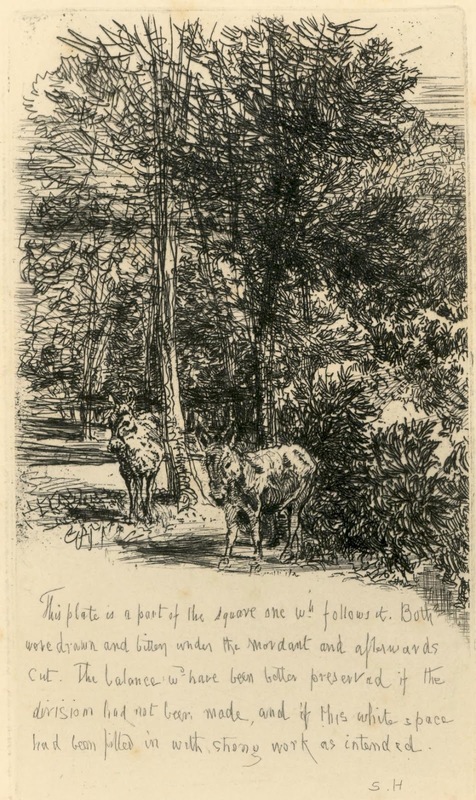 Seymour Haden [Jr.] tells me that later in his life his father was in the habit of presenting impressions of this plate to engaged couples” (Schneiderman, Richard 1983, A Catalogue Raisonne of the Prints of Sir Francis Seymour Haden, Robin Garton, Wiltshire, p. 129). 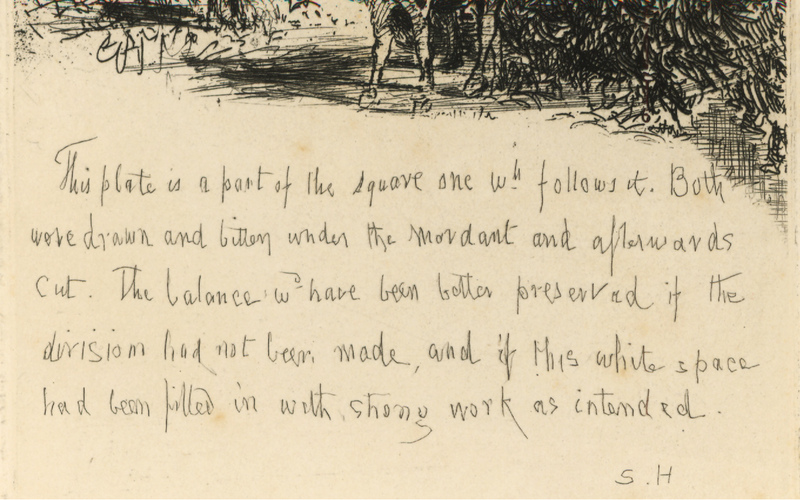 Clearly Haden liked to share his mistakes as a warning for others. 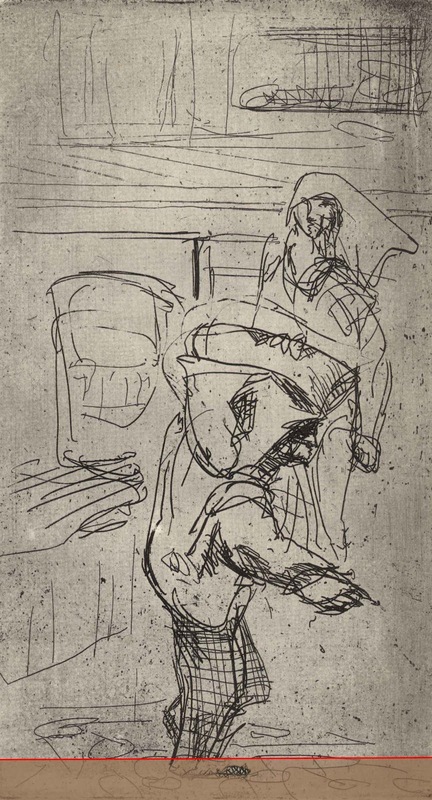 Despite Haden’s reservations about his cropping of the printing plate, the line of division does address the three principles that artists usually consider (even if intuitively). 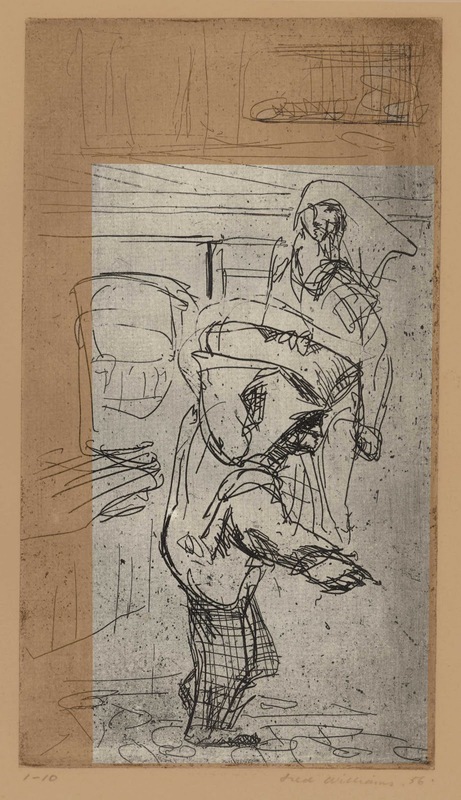 Regarding the first principle, the division line enables both prints to be read as independent images with their own projected meanings. 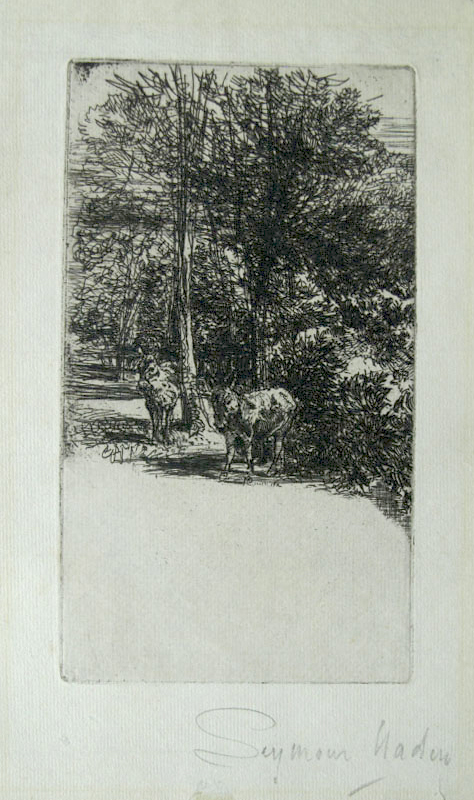 In my reading, The Two Asses invite contemplation about the relationship between the two animals and, in turn, their relationship with the surrounding landscape; Dundrum River projects a sinister mood arising in part by the dark recesses between the distant trees and from contrast between the mechanically horizontal lines of the sky against the organically curly lines of the foliage. Regarding the second principle, the line of division is a superb example of cutting the original rectangle at its golden section. Regarding the third principle, if the pattern of lights and darks were extracted in a conceptual way (see diagram below), then the proportion of drawn areas (the darks) compared to the unmarked areas (the lights) would be close to the Golden ratio. In short, both Haden and Williams had fine aesthetic eyes when they chose to crop their images. I received a welcome note from the print dealers, Barham Money Fine Art (http://www.barhammoneyfineart.co.uk/), regarding Haden’s etching The Two Asses. 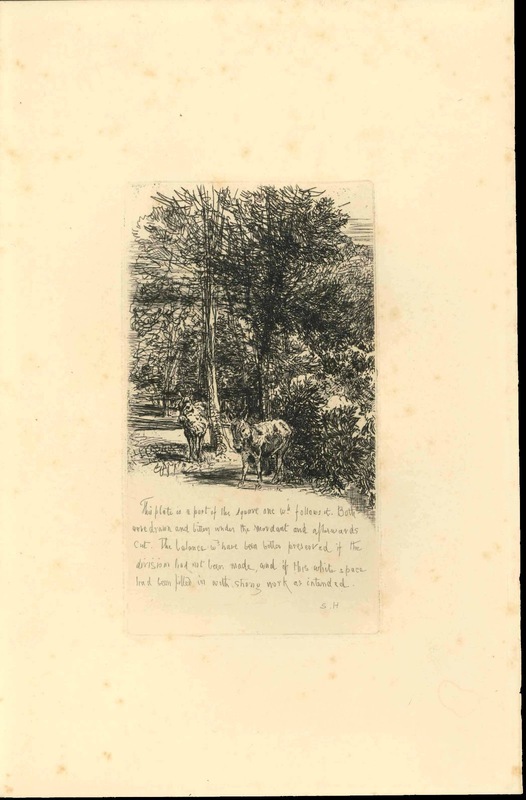 They have a rare first state signed copy of the print before the addition of Haden’s inscription lamenting the barren foreground (see below). After looking at the plate in this untouched state Haden’s conundrum about finding a way forward is clear.